Rajasthan PTET Application Form:- Candidates who are willingly waiting for Rajasthan PTET Notification 2019, We have a news for them that The Dungar Govt College, Bikaner has been announce the applications for Rajasthan PTET 2019 for the academic session 2019-21. So students can apply the Dungar College Bed Entrance Application Form. We have given below all the details regarding Rajasthan B.Ed. Candidates, who want to make their career in the field of teaching can get admission in many reputed and affiliated B.Ed colleges/ institutes in the Rajasthan state. Applicants who want to appear for Rajasthan PTET 2019 should fill and submit their Rajasthan PTET 2019 Application form as per schedule date. Students can get the complete Dungar College PTET Notification of Rajasthan B.Ed like as eligibility criteria, application form, admission procedure etc from the article mentioned below on this web page. Applicants check the complete info regarding Rajasthan PTET 2019 Notification from the this page also. This year the Dungar Govt College, Bikaner ready to conduct the Rajasthan PTET examination. So candidates can fill their Rajasthan B.Ed Application Form 2019 before the closing date. We have inform to all that the Dungar Govt College disclosed the Rajasthan PTET 2019 Application Form. Eligible & interested candidates can fill the Dungar College PTET Application Form. The University releases the Rajasthan PTET Online Application form from 14th February. The admission process continue till the May-June 2019. 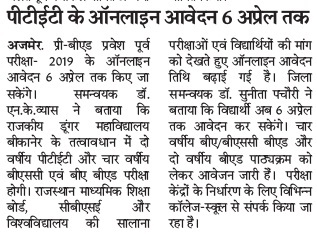 The Dungar College officially conduct the Rajasthan PTET Exam 2019. Applicants get ready to fill the PTET Application Form with their documents. Applicants whose want to enroll in Rajasthan PTET Admission to be a govt. teacher than they all have to apply online for Rajasthan PTET 2019 Registration Form and have to qualify this examination. There are a large number of applicants who want to admission in the Rajasthan PTET 2019. If you are also one of them, then you are on right page. Check the complete details here or through the official site also. Participators can check the Rajasthan PTET 2019 Important dates. Dungar College released the exact dates now. It must be noted that these dates are likely to change. Applicants need to be a Indian Citizen. Applicants must have qualified the 12th/ Intermediate/ Senior Secondary from a recognized board of India. They must have 50% marks in the Bachelor Degree. For the reserved category candidates must have 45% marks in bachelor Degree. Candidates who have want to apply the Rajasthan PTET 2019 Application form, they must submit the Rajasthan PTET Application fee. Candidates must pay Rs. 500 for application fee through online & offline mode also. Candidates visit the official site. Now enter the application form. Applicants needs to fill the mandatory information in the form. The details will be general such as name, age, Category, and their education qualification details. Now attached the recent size photo & Signature also. Now pay the Application fee Rs. 500/- through Debit/ Credit & Net banking also. Not to forget take a print out of the application form for further uses. 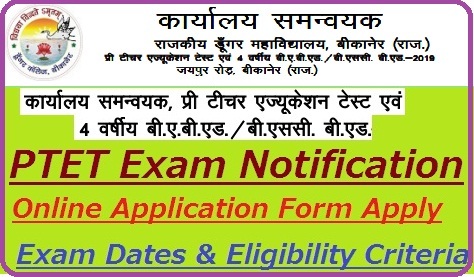 Candidates can check the official Notification of PTET 2019. We have update all the details here after release the Rajasthan PTET Notification. We have advise to applicants that they have visit here regularly basis regarding Rajasthan PTET Application Form 2019. If any candidates have more details regarding Dungar College PTET Application form than they can visit the official home page also. Hello Krishna, Abhi tak official Notification nhi aaya, Last Feb tak a jayega. Bsc.bed.k form kb se bhare jayagee. Class 12 k students jinka abhi ex.h vo pree.test bsc.bed ka Dr skate k Kya.